Make her day with a bouquet that is a reflection of the exquisite and breathtaking woman she is. A collection of beautiful lavender roses is complemented by luscious salal leaves and placed in a glass vase with a hammered metallic gold base. 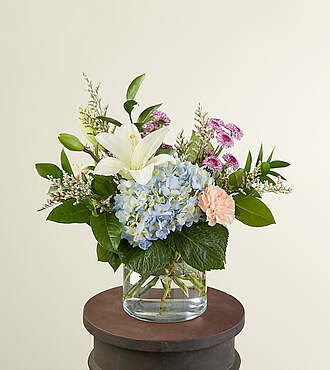 From delicate blooms to a bold vase, our Hello Beautiful Bouquet is perfect for saying, "Thank you for all you do," or "I wouldn't be who I am without you". STANDARD bouquet is approx. 17H x 13W. DELUXE bouquet is approx. 20H x 17W.